Andrea Ballinger, the lone senior in the Buckeye tennis Class of 2019, was recognized prior to Sunday’s match in the Varsity Tennis Center. 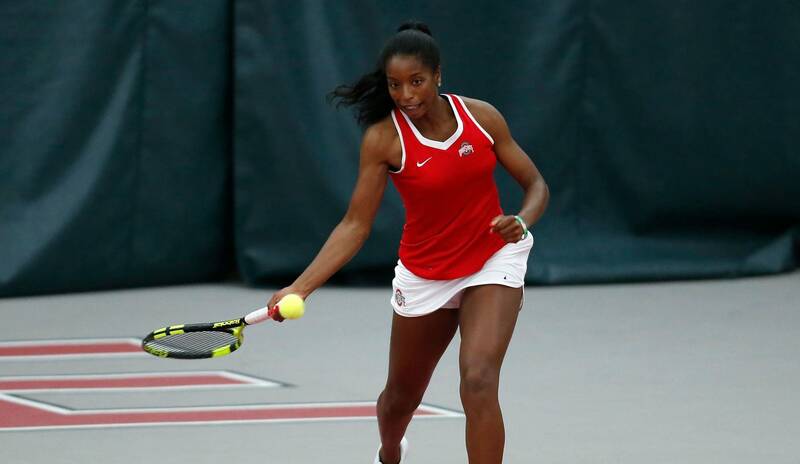 The Buckeyes won the match vs. Indiana, 6-1, with Ballinger hitting the winner to clinch the doubles point for the Ohio State. A native of Columbus and graduate of Columbus Academy, she is a Spanish and psychology double major, on a pre-med track. Ballinger has been a part of two Big Ten regular season championships and two Big Ten Tournament titles, along with three straight NCAA Tournament appearances, including a semifinal trip in 2017. Ballinger has been named an Ohio State Scholar-Athlete three times and will earn her third Academic All-Big Ten honor this spring. She traveled on a Bucks Go International trip to Bolivia, working with Soles4Souls, in Summer 2016. What is your major? I’m double majoring in Psychology and Spanish and completing the premed track. What are your future career plans? I will be taking a fifth year to finish my Spanish major and then I will apply to medical school. I would love to continue to be a Buckeye. What has been your favorite Buckeye roadtrip? I think any freshman or sophomore year road trip. I just remember doing a lot of driving those years to Indiana, Penn State, Northwestern, etc. The drives were always so eventful. 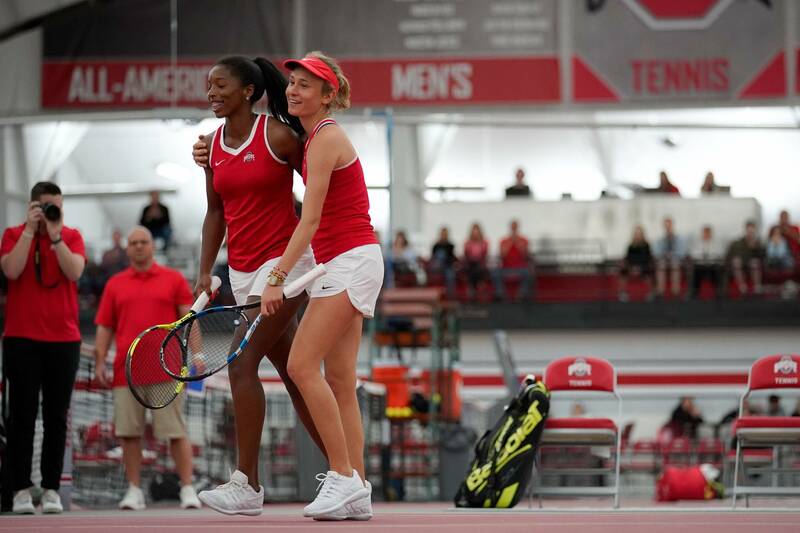 Most memorable Buckeye team match (so far) – Oh that’s easy! Freshman year National Indoors against Vanderbilt. It was 3-3 and came down to our Miho Chan! I don’t think I have ever been more excited after a team win. The pictures of us rushing up to Miho shows it all. 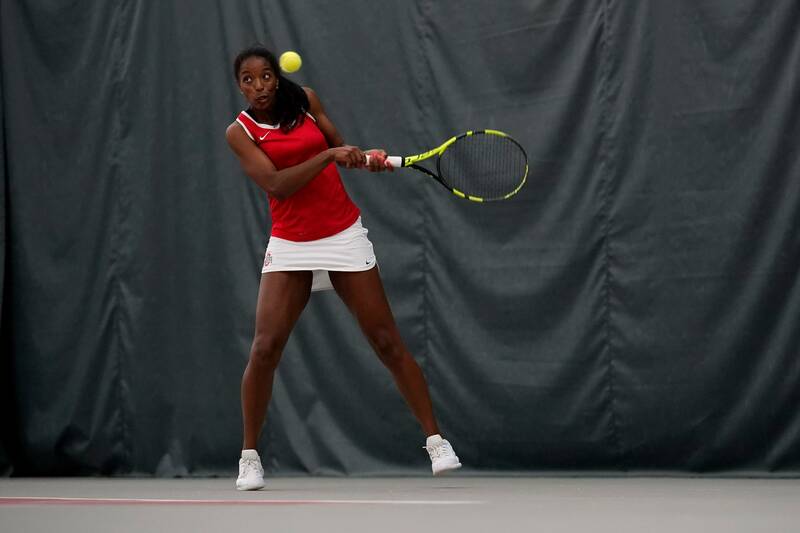 What will you miss most about collegiate tennis? I will miss being on a team. Tennis is a tough sport. We have summer training and workouts, long seasons, mental and physical fatigue, but you have 8-9 other girls there struggling and pushing through with you. We spend a lot of time with one another between practices, studying, and team trips, so it will be weird not being with them every day next year. I will miss having an instant support group and being with them on court every day. Which do you prefer … indoor or outdoor tennis? I actually really like outdoor tennis, especially when it’s super hot, but I do prefer the quickness of indoor tennis. I guess it really depends on the day. What’s your favorite spot on campus? Definitely Thompson Library. It is so beautiful and there are so many nooks and crannies you can find to study. I find it to be very relaxing and peaceful despite how busy it normally is. And a favorite place in Columbus (outside of campus)? Maybe the Short North or the Arena District. I feel like I find a new restaurant or place to shop with every visit. What activities are you involved with outside of tennis? I am in two – going on three – research labs. The first is a stereotypes and prejudice lab, the second a urology surgical residency education lab and the third is one in which I actually just got accepted, the ASPIRE Research Program through OSU’s College of Medicine. I am a member of the Student Athlete Advisory Committee and Blueprints for Pangaea, which is a student organization dedicated to redistributing unused medical supplies to communities in need. I also am a member of Alpha Kappa Alpha Sorority, Inc. Leisure activities I enjoy the most are writing, playing the piano and watching Beat Bobby Flay. How has it been being the only senior on the team this year? It has been a welcomed challenge. We have four new girls this year and I definitely have felt a personal responsibility in making sure they are acclimated to our team culture and making sure that our team really works well together as a unit. We are such a small team so making sure everyone is on the same page and has the same goals and team values has been really important for me. I want to make sure that when I am not on the team next year, the girls know what it means to be good teammates and to really care for one another and work hard for each other day in and day out. What is your favorite thing about the sport of tennis? I love how independent tennis is while still having some semblance of teamwork and cooperation. In singles, you can’t blame anyone but yourself for what happens and you don’t have to depend on anyone else. In doubles, you can relax a little more. You actually have someone out there with you that can cheer you up and lighten the mood of potentially stressful situations. Any words of wisdom for the younger Buckeyes? Before you know it, it will all be over, so cherish every moment you have as a Buckeye. What would be your dream vacation? A month-long trip throughout Spain. How have you been able to balance academics and athletics (and ALL of your other activities)? This is a tough question. I think whenever I’m right in the middle of the school year and season (like now), I think I’m doing terribly, but when the semester is over and I take a look back I realize just how good of a job I’ve done at keeping myself together and managing school, tennis, my sorority, research and volunteering. I’ve had to learn how to make sacrifices and be okay with not attending every event on campus and being okay with saying no. That has definitely been key to making sure I am staying on top of my work and managing all of my activities. Any pre-match superstitions? I actually don’t have any. I don’t think I ever really have been that type of person, which is actually really surprising. Favorite pre-match meal? Bob Evans for sure. I’ll have a plate of home fries and banana bread and I’m ready to go! Your parents seem to be at nearly every match? What has having their support throughout your career meant to you? It really has meant the world to have my parents support these past four years. I’m really fortunate to go to school at home and know that they will be at every match. I think I have taken for granted a bit their ability to travel and come watch a lot of our away matches, but those matches are even more special. To be able to go to another school and know that you still have a support system there for you, I’m just very fortunate. Knowing that no matter what my parents are there to cheer me on is really comforting. I’m so lucky to have had their unwavering support throughout my career here. Scarlet or Gray? Scarlet. I’m a sucker for the bright red. Can you sum up with the last four years as a Buckeye have meant to you? Transformative. I definitely am not the same girl I was freshman year and I owe a lot of that to my time here on the tennis team. I’ve been a part of the Wolstein Leadership Academy, traveled abroad with Soles4Souls and so many other experiences that have helped me grow and mature into a more confident leader. Pushing through injuries and frustrations on and off the court has made me tougher and I feel I am well prepared for any challenges I may encounter in the future. I’m truly grateful to have had this opportunity and experience. Buckeye head coach Melissa Schaub talked about Ballinger and time with the Buckeyes.